Bugs 3 vs Bugs 3 Pro, which one would be the best? Well, first we have to know what the new Bugs 3 pro is all about and that’s why this review is supposed to do. 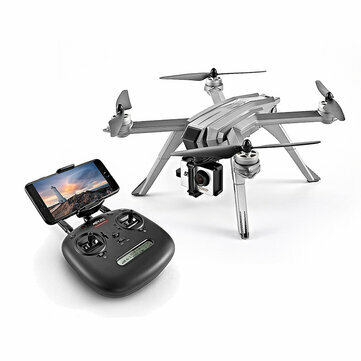 To spike your interest, this is a very good GPS drone for people who already have an action camera or simply for anyone interested to get it with the included Full HD cam. Most drones from MJX that are in the Bugs series (there’s quite a few at the moment) tend to have both long battery life and quite powerful brushless motors. This is no exception, as the battery can last for up to 15 minutes ( expect about 13 in real life). But this time around, it also comes with a very cool GPS module that does a much better job than the one on the Bugs 2( that did the toilet bowl movement). The drone comes with all that you need to start flying, but the package varies depending on what you choose to buy. 720p cam (one or two batteries) – this is the most budget version, I don’t recommend. As you can see, the package has all you need, just like the usual one and also comes with the useful manual and controller scheme. If you want the package with the MJX camera and pay extra, the camera will come in a separate box. Considering the price of this quadcopter, it’s quite a steal, especially if you already have the camera. If you get the included camera, then you’ll pay about $50 more, but you’ll be able to use the live app Bugs Go and the Follow me and waypoints functions. So I’d recommend the bugs 3 for people who have had at least a one time experience with other drones flying (not complete beginners). Even though it has GPS and it can return to home automatically, the motors are pretty powerful. If you have any action camera that is the size of a go pro hero 3 or 4, you’re good to go. If you want the version with the included camera I recommend buying the 1080p version. 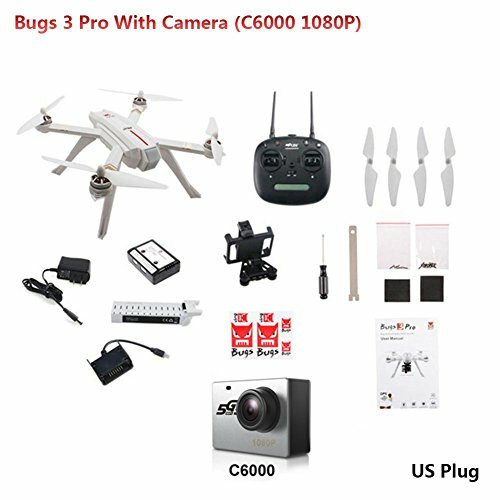 But if you’re not going to use it with an action camera ever, just with the included c6000 cam, then I’d rather recommend you the Bugs 5w, which in my oppinion has a better and more stable image at an even lower price. The transmitters of all the Bugs drones in general have a very similar look, and they also come with a simple quickstart guide that have the controls mapped in an easy to understand fashion. The range is pretty big, and the bottom screen shows very important telemetry information like range, height, signal and battery life. So even if you lose visuals, you’ll be able to press the return to home button and see how the distance from you is decreasing, meaning the drone is coming back. Trust me, it’s very reasuring. The Bugs Go app can be downloaded for free, both on android and on Iphone and works with every bugs drone so far. You need a 5G wifi capable smartphone to connect to the wifi and then you’ll be able to see the live image in the app. you can also use the live stream app of your action cam to monitor what the drone sees. It's going to be cheaper if you already have the camera. Ofc. You can use the app with follow me, waypoints. This quadcopter is a great choice for anyone looking for a budget camera drone that can actually take some really nice footage. It's also powerful enough so it can carry things and you can even put a gimbal on it for some more cash.